So I'm REALLY going to start working on my book. But it's going to be a blog first. It has been my idea for a while to write a book about "boy bands" of the last 60 years. But instead of using the term "boy bands" which connotates a certain 90s/2000s group of bands (n'Sync, Backstreet Boys, The Jonas Brothers), I will use the term "bands of boys" to include those "boy bands" and others, like The Beatles, The Four Freshman, The Temptations, The Jackson 5, The Monkees, Take That, The Four Seasons and so-on-and-so-fourth (and I will take arguments for bands that I have not thought of). So, if you, or anyone you know, is a fan of a certain band of boys, please turn them onto this site or let me know how to reach them. I am very interested in their stories. Sorry this is coming at you with a whole year to go at this point, but it's worth it. Erran Baron Cohen is the brother of Sacha Baron Cohen (Borat, The Ali G Show, etc.) and composed for his brother's show and movie. He was recently commissioned by the Kazakhstan Philharmonic Orchestra to compose a piece for them after the release of his brother's movie Borat. Cohen studied Kazakhstani folk instruments so that he could incorporate them into his piece. This is Cohen, Jules Brookes and hasidic rapper Y-Love on the Conan O'Brien Show. Y-Love feel styles in Arabic, Hebrew, English, Yiddish, Aramaic, and more. 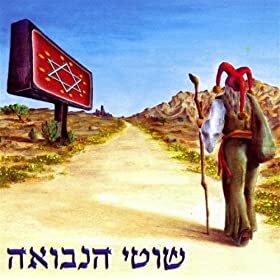 The rest of the album consists of covers of traditional Channukah songs and originals featuring vocalists Idan Raichel (an Israeli artist that I hold near and dear to my heart and will soon blog about), Avivit Caspi, Dana Kerstein and Yasmin Levy. The musical stylings range from Middle Eastern to klezmer and hip hop to rock. Check out his interview on NPR's "Fresh Air" here. Buy the CD for next year here. check out his myspace page here. 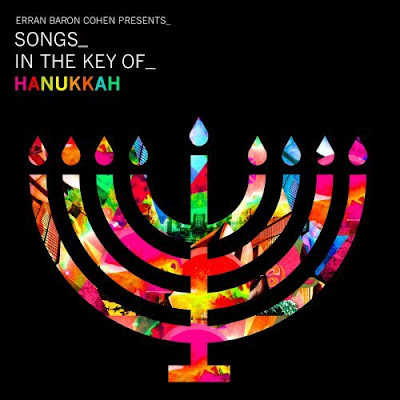 I've also added "Dreidel" to my playlist as well as the tune "O Kazakhstan" that Cohen composed for the movie Borat, just because it's hilarious. My favorite Shotei Ha'Nevuah song is called "Kol Galgal" meaning "The Sound of Circle" or even "The voice of the wheel" (Hebrew speakers correct me here, my Hebrew skills have long since declined since my Bat Mitzvah, and I don't trust the internet). It's one of the most gorgeous songs I've ever heard. My aunt said that she's never heard Hebrew sound so beautiful. it goes and wanders in the world. and the circle spins around. the sound of a circle going up and down. I also found another translation here. Here is a video someone put together of rather nice beach shots in Tel Aviv. They have a pretty gorgeous beach actually, one of the nicest ones I've been to that's still so urban. Maybe it helps that it's on the Mediterranean sea... I also found an awesome live version here (with a 100 person choir). "Kol Galgal" is nothing like the rest of Shotei Ha'Nevuah's music. Usually it's more upbeat, and is a sort of "world fusion" (I hate that term) hip hop. I really don't know how else to explain it. Anyway, stay tuned for a couple more bands and HAPPY CHANNUKAH or happy Christmahanukwanzikah. And more importantly, a happy new year. p.p.s. No one took me up on that CD mix that I'd say I would make for you if you wanted. I was serious about that. Many of you may have heard about this already, but NPR and The New York Times have both run stories about The AccoLade, a all-female rock band from Jeddah, Saudi Arabia (you can listen to the NPR radio spot here). 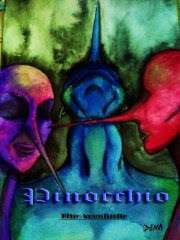 The three college students posted the tune "Pinocchio" on facebook and myspace and at first, only had a couple dozen fans, but now they have over two thousand. They do not play live shows or share their full names, nor to they post images of themselves on the internet out of respect for their religion. The NPR story states that "cultivating a modest and somewhat anonymous identity online lets them thrive in this strict society." Instead they interact with their fans on facebook and myspace and share original drawing and paintings to represent themselves (see the above images). Anyone in this world can play, hear and create music no matter what their gender is or nationality, we are making music and we would appreciate it if the comments are only about our music, lyrics, paintings, where talk about our song, or how good/bad our song is…and omit anything that is irrelevant or inappropriate . Read an interview with them here (scroll all the way down). I am so impressed with these women and their courage to live and make music within the system, even in a city like Jidda, by far the most cosmopolitan city in Saudi Arabia. It got me thinking about other female Muslim musicians and also how the internet is really revolutionizing and changing the world that we live in. 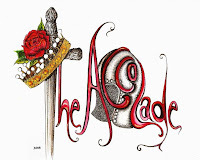 It as has made things possible for women like The AccoLade to do what they love and share it with others. Another woman who comes to mind is Souad Massi, an Algerian singer/songwriter who started playing as a teenager and was immensely influenced by American roots music, flamenco and rock bands like Led Zeppelin and U2. In the 1990s she joined an Algerian hard rock band called Atakor, but because of the political climate (civil war), political lyrics and growing popularity became a public target. Massi tried disguising herself by cutting her hair and dressing in male clothing. But despite these efforts, she began to receive death threats, so she left the band and moved to Paris in 1999. Massi, finally found massive success in her solo career in Europe. This is a clip of a gorgeous performance in Brazil of the tune "Yemma," a song for her mother. I also think it's fascinating that a band, in this age of the world wide web, no matter who or where they are, can be successful and have fans, without ever leaving their homes; ESPECIALLY if they don't want or need to make money from their music. They don't need record labels, or CDs or managers. Just an audio recording and an internet connection. If you are a Muslim female musician or are a fan of a Muslim female musician, Please check this out: there is an effort out there by the English organization called Ulfah Arts to connect these women and give them a supporting network. Ya Se Fue! Ya Se Fue! I love NPR. It's really the only radio station I listen to on a regular basis. I used to listen to the radio a lot in high school, but now I usually just like to listen to my own music. But sometimes I really do find really terrific community radio that I like, but I have to actively go out and find it. NPR and it's regional affiliates, are the only stations I can stomach. It makes me feel smarter. Anyone else feel that way? I know you do. I also tend to think I have much in common with other folks that support National Public Radio. After working for KUT in Austin I have great respect for the folks that are in charge of the music programming. I also know that their music tastes tend to be more under the radar than, say, oh, Top 40 radio. But that's no surprise. SO, first and foremost, I want to direct you to a KQED's (NPR Bay Area affiliate) interview with Ozomatli. In the interview the men of Ozomatli share many of their political and social views, poke fun at each other and play some tunes live. Last Thursday I saw Ozo play a reunion show with rapper Chali 2na (also of Jurassic 5) at the Fillmore in San Francisco. They put on an absolutely awesome show. I've seen them now probably 5 times in the last 10 years all over the country and have enjoyed them every time. Los Angelian based Ozomatli plays music that is somewhere between hip-hop, Mexican dance music and funk. All I know, is that it's a massive dance party every time they play. I was a little concerned about the show since I haven't been too excited about some of their newer tracks ("Don't Mess with the Dragon" and "Saturday Night"), but they whipped out the old tunes with great energy and passion ("Cumbia de los Muertos," and "Super Bowl Sundae"). They ended the show, as they do every show, coming into the audience, playing in a drum circle, and leading folks out into the lobby as the show ends. This last show was complete with breakdancing chickens and giant Ozomatli balloons. Anyway, if you like Ozo, or are interesting in getting to know one of the best under-appreciated bands of the last 15 years, check out this hysterical interview. These guys love what they do, and they love each other, which always adds to the enjoyment and chemistry of a live show. Also, today NPR released a list of NPR listener picked best music of 2008. NPR's website has clips from each of these tracks, so if you are interested in what you may or may not have missed this year, check out this list. I believe there is a podcast to download as well. I haven't heard all of these bands, but most of them are pretty darn good. I've hilighted some of my personal favorites. I will also add some tracks onto the playlist. If you feel like it, leave your favorite album of the year in the comments, either on this list or not. I'd love to know what you've loved this year. I would add Gnarls Barkley's The Odd Couple. 1. Fleet Foxes - Fleet Foxes "White Winter Hymnal"
2. Vampire Weekend - Vampire Weekend "A-Punk"
3. Bon Iver - For Emma, Forever Ago "Skinny Love"
4. TV on the Radio - Dear Science "Halfway Home"
5. Death Cab for Cutie - Narrow Stairs "Cath..."
6. MGMT - Oracular Spectacular "Time to Pretend"
7. She & Him - Volume One "Change is Hard"
8. Coldplay - Viva la Vida "Lover's in Japan/Reign of Love"
9. My Morning Jacket - Evil Urges "Evil Urges"
10. Flight of the Conchords - Flight of the Conchords "Business Time"
11. Sigur Rós - Med Sud I Eyrum Vid Spilum Endalaust "Inní Mér Syngur Vitleysingur"
12. Okkervil River - The Stand Ins "Pop Lie"
13. Beck - Modern Guilt "Chemtrails"
14. Kimya Dawson and Antsy Pants - Juno (the soundtrack) "Tree Hugger"
15. The Raconteurs - Consolers of the Lonely "Many Shades of Black"
16. Girl Talk - Feed the Animals "In Step"
17. The Black Keys - Attack & Release "Psychotic Girl"
18. Conor Oberst - Conor Oberst "Lenders in the Temple"
19. Jenny Lewis - Acid Tongue "Acid Tongue"
20. Kings of Leon - Only by Night "Manhattan"
21. Bob Dylan - Bootleg Series "Dreamin' of You"
22. Punch Brothers - Punch "Blind Leaving the Blind: 1st Movement"
23. The Hold Steady - Stay Positive "Constructive Summer"
24. Of Montreal - Skeletal Lamping "Id Engager"
Again, please leave your favorite music of the year as a comment. I'd love to hear it whether it's Britney's new album (you know who I'm talking to) or Poison Apple Pie. Just in time for the holidays: Indiana University's own male collegiate a cappella group Straight No Chaser has landed a record contract with Atlantic Records based on their performance of "The 12 Days of Christmas," a viral video that spread like wild fire last year. For those of you that don't get the joke (and don't feel bad, we can't all be huge college a cappella dorks), Toto's "Africa" is THE cliche college a cappella tune. Don't know why, it just is. Straight No Chaser is on tour promoting their newly released Christmas CD "Holiday Spirits" and will be playing the Great American Music Hall in San Francisco on Monday December 15th. Anyone want to go with me? I miss this stuff. College a cappella is great music, and these guys are as good as it gets. I mean, 'N Sync wishes they could pull off a performance as good as these guys. Check out how effortlessly Straight No Chaser slips from tune to tune and style to style in this version of "The Lion Sleeps Tonight" including bits of "Brown Eyed Girl" and "Don't Worry be Happy." The Stop Shopping Gospel Choir: What will YOU give? This is awesome. Time to get on my soapbox. Among the billions of political email lists that I'm on is Brave New Films: the folks who brought us John McCain's Youtube just became a Nightmare and more. I saw this today: Reverend Billy and the Church of Stop Shopping and the soon to be released documentary "What would Jesus Buy". It's pretty obvious were I'm going to go with this. Mindless gift giving has always baffled me. Other than trying to be loving and thankful for wonderful people in my life every day of the year, I often show my love by giving gifts at random times of the year because I find something that I think that person would really like. Sometimes I can wait long enough and keep it for a birthday or the holidays. I really don't understand giving things to people just to give them. Especially if they're going to sit in the closet unused. How wasteful. 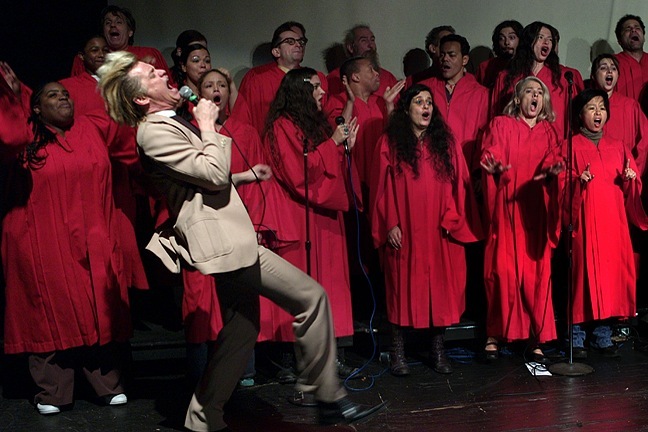 How do we save ourselves from what Reverend Billy calls the "Shopocalypse"? Black Friday and Holiday shopping seems to have reached a new peak of horridness when three people lost their lives this year. And with the economy taking a turn for the worst, it seems like the perfect time to re-evaltuate how Americans show love and thanks for our friends and family. 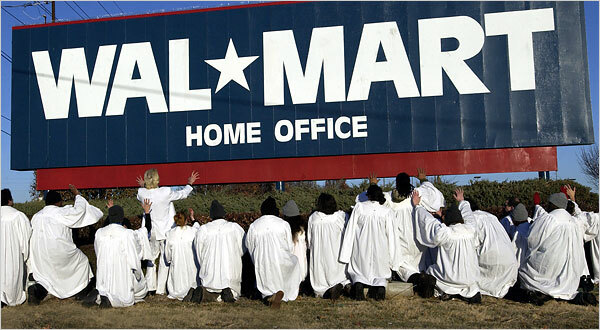 The Church of Stop Shopping. The mission is pretty obvious. Consumerism is running our lives and ruining our happiness. Put the heart and local soul back into our communities. Have you seen the Story of Stuff? (It's great!) Our lives are driven by the stuff we own, and it's killing us, it's killing the planet and we're now savagely also killing each other. What will you give your friends and family this year? Please leave a comment and share with alwaysmoretohear what you will do. I will, surprisingly (!) be giving the gift of music. And dear readers of alwaysmoretohear, I will make you a CD mix, if you want one. Give any special requests if you have them. Just let me know. I will also be giving out a bunch of hugs. 4. Tag 10 friends who might enjoy doing the memo as well as the person you got the memo from. 5. Add a pic that you think represents you at this moment in time. 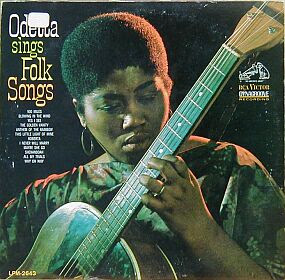 Odetta is an artist I've really never fully appreciated, simply because I haven't taken the time to check her out. Unfortunately, she's never gotten the overwhelming popular support as Mahalia Jackson, Pete Seeger, or even Nina Simone (although Simone is more popular in death than she ever was in life). But after hearing some clips of her performances on NPR last night reporting on her death, it is her powerful voice and exquisite lyrical phrasing that has drawn me in to learn more about her. I knew of Odetta through my time spent interning for Smithsonian Folkways, and I knew she was very influential in the folk world and I knew she must have been instrumental in the civil rights movement simply due to being a black female in the 50s and 60s. This is probably also what kept her from being as well known as she should be. She had continued to perform up until last summer when she developed kidney trouble. In 1963, Odetta sang at "I'm on My Way" at the historic March on Washington, D.C. where Martin Luther King gave his "I Have a Dream" speech. She is known to have wanted to perform again in Washington in January at Barack Obama inauguration. I think it is a blessing that she at least lived to see his election; a direct result of the Cause she had been fighting for for most of her life. Unfortunately the video and audio clips available to link to here aren't as awesome as what I'd like, but hopefully you'll get an idea of the power of the voice of Odetta. You might be able to hear what a great influence on folk singers ranging from Bob Dylan and Peter, Paul and Mary to more contemporary singers like Tracy Chapman. Read about her life here. Watch this performance of "What a Friend We Have in Jesus" with Tennessee Ernie Ford. And this neat Led Belly inspired (specifically the percussive "Pah!" vocal sound) performance of "Water Boy". I've also added some songs to my playlist that I hope reflect her power and dignity as a performer and singer. Unfortunately there wasn't much to choose from on the playlist site that I use. The internet is buzzing with clip featuring Jack Black, Margaret Cho, Andy Richter, Maya Rudolph, John C. Reilly, Allison Janney, Kathy Najimy Jennifer Lewis, Neil Patrick Harris and more. If you've already seen it, watch it again. It's faaaabulous. It's about time I blogged about one of my favorite things that I am proud to be part of in this lifetime: Girls Rock Camp, the promotion of women in music and in the arts and entertainment industry in general. 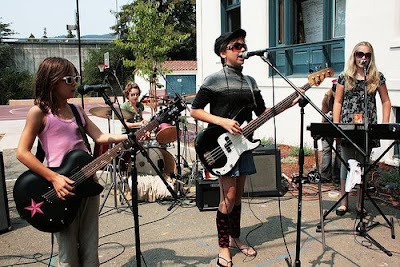 Girls Rock Camp started in Portland, Oregon in 2001 with the mission of building self-esteem of young women through music creation and performance. The concept has since exploded nationally and internationally with dozens of new camps popping up in new cities every summer (I believe there will be around 50 worldwide in the summer of 2009). As each camp develops, organizers and supporters get more ambitious; there are Lady Rock Camps (for us older girls), documentaries, after school programs, tours, showcases and even more exciting, bands that met through camp but gig on their own. Just watch: music is going to be very different as these girls grow up. Has anyone else noticed how more and more women are popping up in indie bands? And not just as the singer or keyboardists! When I lived in Austin I helped out the Girls Rock Camp director in her endeavor in initiating the first camp in Austin. I helped the younger girls, all around 10 years old, write two songs: one about the ghost Bloody Mary, and another one about ice cream tummy aches. When I saw them perform, I bawled my eyes out in shear joy. I was so moved and inspired by them. Girls Rock Camp Austin is now going into it's third year growing to include several sessions a summer, a South by Southwest annual showcase, and Lady Rock Camp. The Mayor has declared December 11, 2008 the Official Girls Rock Camp Day. The girls are taking over Austin! Now that I live in the Bay Area, I'm lucky to also be riding in the wave of the first-ever Bay Area Girls Rock Camp. This past summer, I volunteered as a band coach for the band Splash! I helped the three twelve-year-olds and one 8-year-old write a song about: what else, writing a song! At camp we made fanzines (out of my old Spin Magazines, go recycling! ), silk screened Splash! 's bands logo onto t-shirts, learned about self-defense and self-image and more. It was awesome. We had the end-of-camp showcase, where every band performed the song they wrote during camp, at the Bottom of the Hill in San Francisco. I was so inspired by these girls and the community that rallied around them. In the band Splash!, I met a 12 year old drummer named Torrey who also played guitar (and rather well I might add). She wanted to learn more. She's now my private student and she's awesome. Even though I'm certainly not the most accomplished musician (I'm going to be learning my guitar scales with her!) there's so much I can teach her. We've been singing, tuning guitars, replacing strings, learning more chords, fingerpicking patterns, music theory, some piano and yes, learning to read music. Torrey had been wanting to learn "Blackbird" for a couple months and I kept telling her, "yeah, we'll do that, but you have to learn basic fingerpicking patterns first." I went away to Australia for two weeks and when I got back, whaddaya know, she's learned Blackbird! Just like that! Gawd it took me months to learn it! Amazing. This girl is a human sponge! Anyway, Torrey and two of her friends (one of them also a former member of Splash!) are now in a group called Poison Apple Pie. So far, they've performed at a wedding and a Girls Rock Camp fundraiser. Here's Poisen Apple Pie performing REM's "The One I Love" at Art Murmur on first Fridays in Downtown Oakland. Torrey is the drummer (you can't really see her, but you can definitely hear her). She's awesome, I'm so proud of her. It'll be a sad day when I have nothing left to teach her. But until then, we'll be playing. If you would like to donate to Girls Rock Camp, click here to get to their website and navigate over to the "get involved" tab on the left. The rock stars of the future will appreciate it! There will be a fundraiser at the El Rio in San Francisco on December 14th, as part of the 50 Shows in 50 States benefit that the Portland Girls Rock Camp has organized to raise money for the Girls Rock Camp Alliance. If you want to find out more about a Girls Rock Camp near you, go here. And also, if you're interested in girl empowerment in general, check out Saturday Night Live Amy Poehler's new project Smart Girls At the Party: an online website celebrating girls who are changing the world by being themselves.